After that last post about the leaf tshirt I tried on the sweater and the short rows did not look right. The short rows were too long (starting directly below the center of the arm holes) and they were too far below the arm holes. So I had added a bunch of fabric below my bust, and wider than my bust, which makes for a really awful looking sweater. Unfortunately this problem did not reveal itself until I had knit a significant amount PAST the short rows. When I tried the shirt on immediately after the short rows it looked great. I guess that to see how the short row shaping is going to look you need to knit an inch or so past the short rows, then try the garment on. Lesson learned. Darts in dress shirts are there to SUBTRACT FABRIC to make the waist of a shirt smaller than the bust. Short rows are there to ADD FABRIC to make the bust larger. The placement of darts and short rows are different. Darts in dress shirts start a few inches directly under the center of the arm hole (at the side seam) at the bottom of the bust, and they angle up to the center of the bust. The darts in dress shirts are much, much longer than the pseudo-darts made by short rows. The pseudo-darts made by short rows do not angle up, they go straight across the garment. 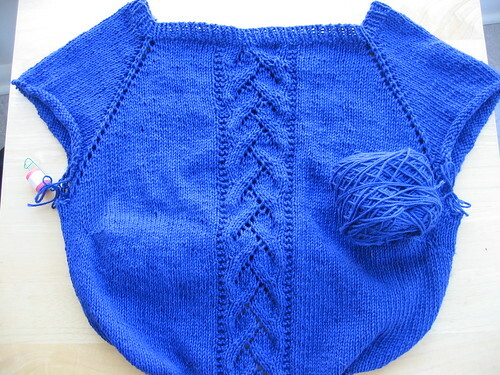 The first stitch of your short rows should start an inch or more in from your armpits and about halfway down the bust. I moved the short rows up and in an inch, and the shirt fits a million times better. Yay!